With Easter closely approaching, I thought we’d take a look at some Easter songs. 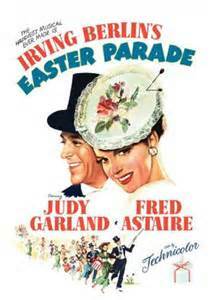 The song, Easter Parade, was introduced in the 1933 musical, As Thousands Cheer. In the musical, this song was sung by Marilyn Miller and Clifton Webb. Irving Berlin wrote the song for the musical, As Thousands Cheer. The melody was written in 1917 under the title “Smile and Show Your Dimple.” At the time Berlin felt this set of lyrics did not work with the tune and filed it away. The song Easter Parade was included in two of Berlin’s other musicals, Holiday Inn with Bing Crosby and Easter Parade with Judy Garland and Fred Astaire. The song was showcased in the 1976 special, The First Easter Rabbit.